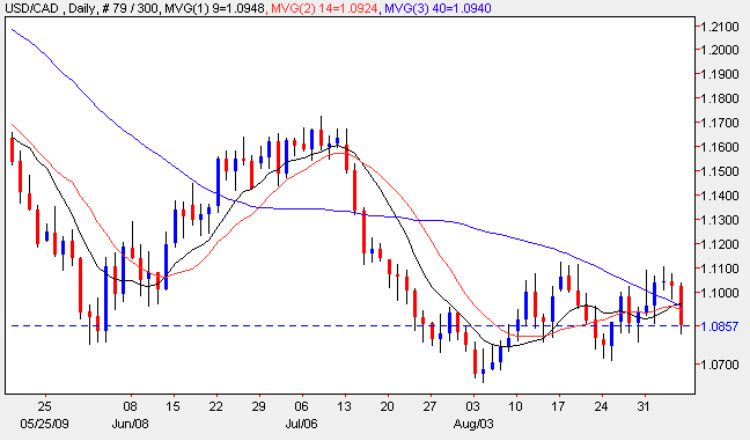 As we suspected towards the end of last week, the usd to cad forex pair finally ran out of steam and fell back exhausted at the effort to move higher, ending the forex trading session and week with a wide spread down bar which signalled once again that the usd to cad is heading lower in the medium term. Friday’s price action breached all three moving averages simultaneously, but as these are now tightly bunched therefore have less relevance than usual. The key support level in the short term is now fixed at 1.07 where the recent small rally found a platform, but should this be broken, then the next price level is 1.065, and from here it’s a straight drop back to parity! The weekly chart for the usd to cad looks equally bearish, with the trading week ending with a shooting star candle signified with a small body and deep upper wick, and with all three moving averages pointing sharply lower, a more dramatic fall seems likely in due course. With both the US and Canadian markets closed today for Labor day celebrations, there are no fundamental news items on the economic calendar for today, so the market may simply oscillate sideways today and wait for a return of full trading volumes tomorrow.